The British ambassador handed Russian authorities a request for the extradition of Andrei Lugovoi, the suspect in the killing of former KGB agent Alexander Litvinenko. Russian officials have said they would not extradite Lugovoi. British Ambassador Anthony Brenton delivered documents requesting Lugovoi's extradition to the Foreign Ministry in the morning, the spokesperson said, speaking on condition of anonymity in line with government policy. The Foreign Ministry and the Russian Prosecutor General's Office said they could not immediately comment, but the Interfax news agency quoted an unnamed official at the Prosecutor General's Office as saying prosecutors had received the documents. Britain's Crown Prosecution Service said last week that it had enough evidence to charge former Russian security agent Lugovoi with the murder of Litvinenko, and on Friday said it had formally requested his extradition. Litvinenko, a Kremlin critic who was granted asylum in Britain, died in a London hospital Nov. 23 after being poisoned with radioactive polonium-210. He had met with Lugovoi and two other Russians, Dmitry Kovtun and Vyacheslav Sokolenko, on Nov. 1 at a London hotel hours before he fell ill. In a deathbed statement, Litvinenko accused Russian President Vladimir Putin of being behind his poisoning, which has deepened distrust between Russia and the West and damaged Moscow's relations with Britain. The Kremlin has denied the accusations. Lugovoi, like Litvinenko a former member of the KGB and its main successor agency, the Federal Security Service, also vehemently denies involvement. Russian officials have repeatedly said that Lugovoi will not be extradited to Britain, citing a prohibition in the Russian Constitution, but that he could be prosecuted in Russia if Britain presents sufficient evidence. A high-ranking Russian lawmaker on Monday appeared to suggest that Russia could extradite Lugovoi in exchange for Boris Berezovsky, an exiled tycoon and Kremlin critic long sought by Russia. But the British top prosecutor's office rejected the idea, long the subject of speculation in the Russian media. 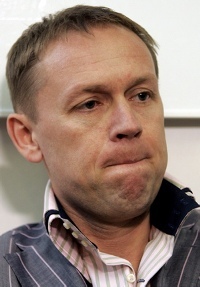 Lawmaker Vladimir Vasilyev also said that Russian law did not allow for the extradition of Lugovoi, but he appeared to indicate that the question was open to negotiation. Vasilyev, who heads the security committee in the lower house of parliament, was asked at a news conference whether a swap of Lugovoi and Berezovsky was possible. "Everything is possible," Vasilyev said. A spokesman for Britain's Crown Prosecution Service dismissed the idea flatly. "No, that's not possible," the spokesman said on customary condition of anonymity. Berezovsky, a one-time Kremlin insider who amassed a fortune in businesses ranging from media holdings to automobiles, fell out with Putin within months of his 2000 election and fled to Britain to escape criminal charges that he contends are politically motivated. Britain granted him citizenship and has refused Russian requests for his extradition. Russian officials repeatedly have complained about those refusals and about Britain's parallel rejection of extradition requests for Chechen separatist envoy Akhmed Zakayev, who also was given British citizenship. Litvinenko, who alleged that Russian security agents were behind 1999 apartment-building bombings in Russia that were blamed on Chechen rebels, was an associate of both Berezovsky and Zakayev in Britain. Berezovsky and his supporters contend that Russia's attempts to return him to the country for trial are aimed at punishing him for his criticism of Putin.